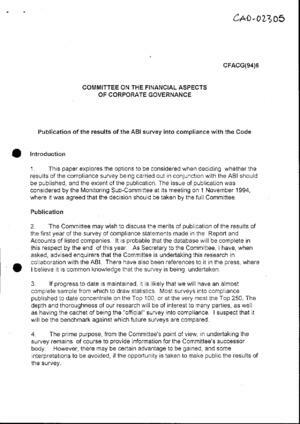 Cambridge Judge Business School : The Cadbury Archive : Publication of the results of the ABI survey into compliance with the Code, CFACG(94)6. Publication of the results of the ABI survey into compliance with the Code, CFACG(94)6. The paper sets out the case for publication of the survey into compliance with the Code.